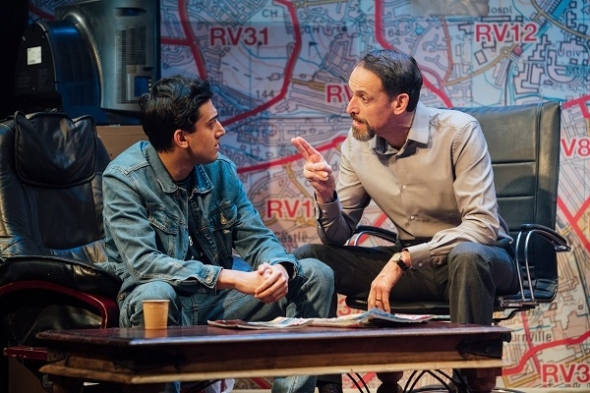 THE WRITER, Ishy Din is interested in exploring Asian masculinity and ‘Approaching Empty’ is a sequel to his earlier play, ‘Snookered’ (2012) which dealt with the lives of four friends who meet every year to celebrate the birthday of a dead friend. ‘Approaching Empty’ finely directed by Pooja Ghai is set in Middlesbrough – the town Din grew up in and is drawn from closer to home – its set in a taxi firm, Kings Cars, run by two friends, ‘Mansha’ (Kammy Darweish) and ‘Raf’ (Nicholas Khan) and the story takes place from the date of Margaret Thatcher’s death on April 8 and her funeral on April 17 2013. Incidentally, the title means when a cab fare is about to end and it is returning to base ‘empty’ but it could easily be interpreted to mean the fragile masculinity of men at the end on their working lives. Raf and Mansha have been friends for over 40 years and now Raf – who is very much into the alues of Iron Lady wants to sell the firm and his friend offers to buy it. However the money needs to be on the table as soon as possible and in cash! You get the sense that Mansha is the voice of the writer, espousing decency and moral values in business, rather than the grasping entrepreneurial spirit of Raf. The firm is not very busy, and we gradually discover that both men worked in the steel industry which is no more. Mostly it’s a male setting of a dingy taxi cab office and the friends are constantly going to the coffee machine to have coffee, and discuss their life together. 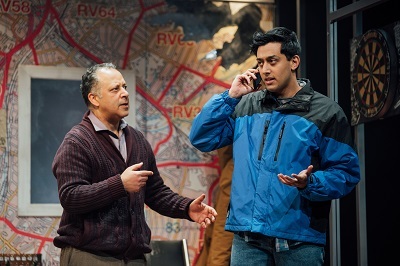 The younger set, ‘Sully’, (played by Nicholas Prasad) the son in law of Mansha; ‘Shazad’ (Karan Gill) Raf’s son and a fine performance by Rina Fatania, as ‘Sameena’, a bolshie female driver looking for an opportunity to better herself are a bit more optimistic about their lives. Meanwhile, Raf wants to teach Shazad the ropes of how the business works but he’s mostly into playing with his phone. Jobs are scare as deindustrialisation has left the city decimated and Uber is yet to make an appearance although rival firm, Fleet cabs could definitely be their nemesis. This Tamasha, Kiln Theatre and Live Theatre coproduction runs at the Kiln theatre until February 2 and then will be touring until April 13.